This page is for the 2001 game. For the unrelated 1993 game, see Stronghold. Stronghold HD. Comes bundled with the original retail release. 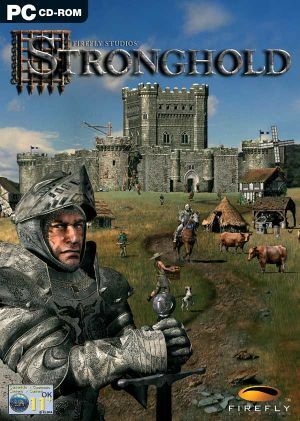 Stronghold HD is an enhanced version of the game which adds widescreen support, higher quality graphics, and various other additions. This official patch will upgrade a retail copy of Stronghold to Stronghold HD. 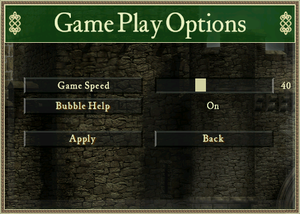 In-game general settings (Stronghold HD). 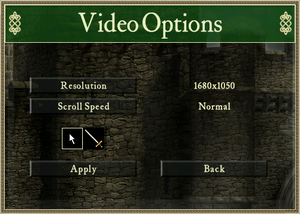 In-game video settings (Stronghold HD). Resolutions up to 2560x1600. For the original release install the HD patch. 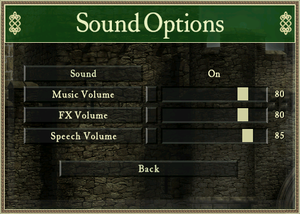 In-game audio settings (Stronghold HD). Added in 1.41 HD patch. Added in 1.4 HD patch. 8 GameSpy services have been shut down; see GameSpy for workarounds. ↑ 2.0 2.1 File/folder structure within this directory reflects the path(s) listed for Windows and/or Steam game data (use Wine regedit to access Windows registry paths). Games with Steam Cloud support may store data in ~/.steam/steam/userdata/<user-id>/40950/ in addition to or instead of this directory. The app ID (40950) may differ in some cases. Treat backslashes as forward slashes. See the glossary page for details. This page was last edited on 15 April 2019, at 05:43.